This past summer I spent two weeks on a sailing ship exploring the west and north-west coasts of Svalbard, an archipelago 10 degrees south of the North Pole. 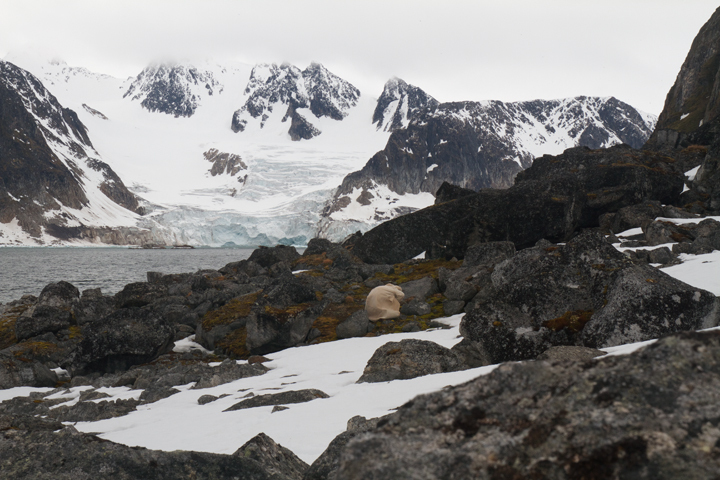 I was there as part of residency program: The Arctic Circle. My companions were 24 artists and writers, an astrophysicist, the expedition leader, three guides and the eight crewman of our ship, Antigua. 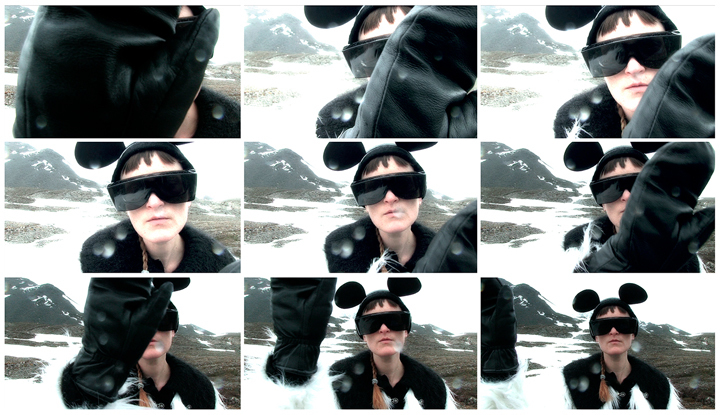 Brittany De Nigris responded to the crispness of of the Arctic not by donning a costume. Rather, she disrobed, exposing herself to the ice, snow and air. She crouched inside the framework of a cube, an idealized form, alone on an ice floe. De Nigris appeared at once vulnerable, as nakedness will do, but also indelibly present, her curls of red hair shocking against the blues and whites of the Arctic. Michael Eckblad, in addition to bouncing light with mirrors and shooting lasers into ice and snow, garbed himself in a fur-lined tanned animal skin, his face obscured by a considerable beard. He performed esoteric rituals and ministrations with the land, often crouched beneath his robe. Upon taking the stage after Michael on a large flat ice-floe many of us used to stage performances, I noticed a yellow stain in the snow. Eckblad denied urinating in order to mark the territory. Why would he lie? Marita Fox dressed in long, luxurious, white fur, Mickey Mouse ears and senior citizen-style sunglasses, from which she stared blankly out into the landscape as she leaned forward over the edge of our speeding zodiac, the rubber boats used to ferry us to and from the ship. Fox referred to herself as “Mickey Yeti.” Fox also spent a considerable amount of time on the above mentioned ice-floe, head-banging to the silence, clad in tight black. Another time, Kumoa appeared in only a blue hospital robe, laying on top of the ice and snow, as if waiting surgery from the elements itself. This was quite somber. Lee Chia-Ling wore a handmade robe of blood-orange red and fur. She wandered the landscape, sobbing, sometimes collecting the tears in glasses, other times peering through lenses. She reminded me of the PSA from the 1980s of the Native American/Indian who shed tears in response to litter in the landscape. I believe that the costumes were a necessary absurdity for some of us, a way of making ourselves strange to our own selves in the beautiful but inhospitable environment, a literalization of our foreignness there. We become twice-fold aliens among the ice floes, glaciers and lichens: aliens distanced from our “actual” selves, and alien to the land. By making our selves strange to ourselves, we could picture having a place there. We could find a way to interface with the environment. 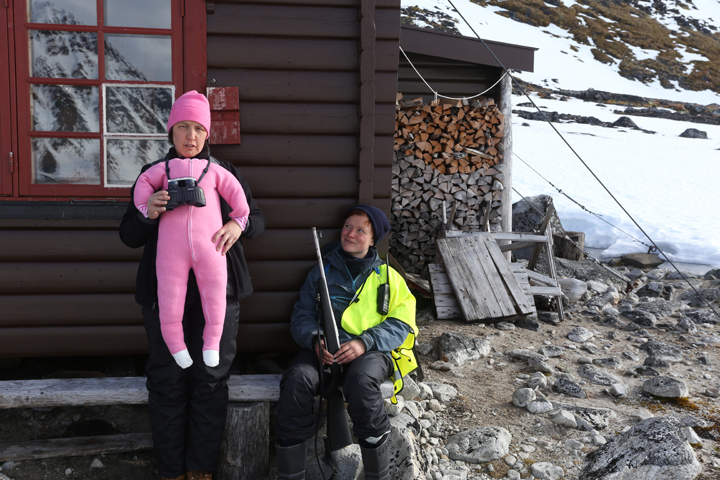 Two times I removed all, or nearly all, of my protective clothing in Arctic outdoors. Once to go skinny-dipping off the beach of Magdalenafjord. The other was to immerse myself in a waterfall after a long, strenuous hike. Many of my companions did as well. For me, these events were two moments in which I felt the most present, the least thoughtful, simply and completely THERE in the Arctic. 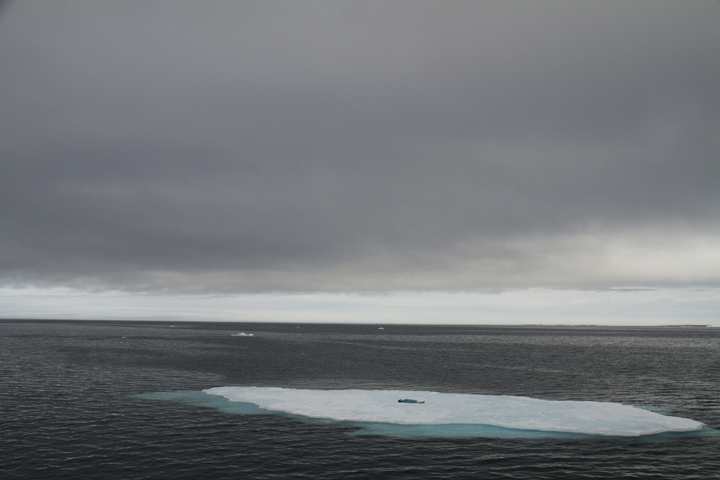 Thanks to the artists for sharing their thoughts on their performances and images and much gratitude to The Arctic Circle, our guides and the crew of the Antigua for enabling it all. Despite so many of us having solitary performances and practices, we bonded together and aided one another like no group I have been part of before. You can buy the entire issue of Lake Hitchcock Center for the Book Arts Magazine 1: The Uncanny Pioneer Valley here. Marita Fox, “The Detached Video Series: Chapter One: Mickey Yeti,” filmed and performed by Marita Fox, edited by Alice Pozzoli. 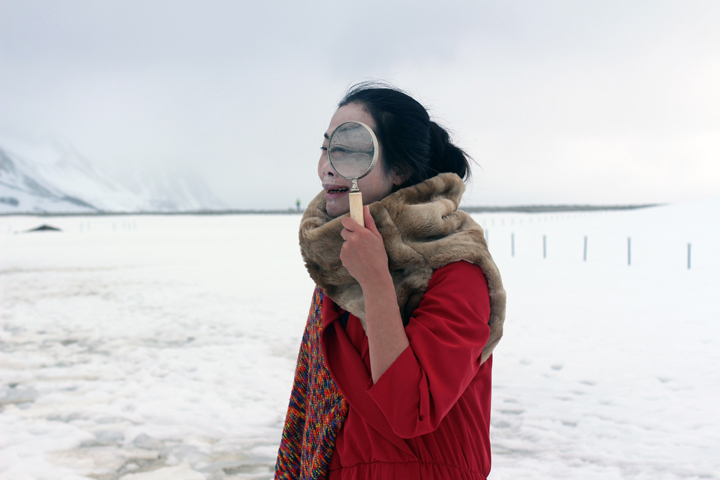 Lee Chia-Ling, “The Arctic Water,” 2013. Stills, sound video, 59 sec. Michael Eckblad. Photo by the artist.